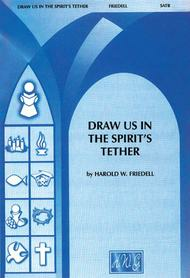 Draw Us in Spirit's Tether by Harold W. Friedell S.J.. Edited by Gwyn Michel. Arranged by Harold W. Friedell S.J.. Choir Sacred. For SATB choir and organ accompaniment (SATB choir). Choral (Sacred); Choral Octavo; Worship Resources. Sacred choral octavo (SATB). Suitable for communion or general use. Choral. Grade 3. Octavo. 8 pages. Published by Belwin Music (AP.GCMR02472).